Apple's plans to move its flagship San Francisco retail outlet may have hit a slight bump, as the city's mayor has said that he'd like to reconsider the plan for the store after critics asserted that its construction would call for the removal of a local landmark. San Francisco mayor Ed Lee said on Thursday that he hadn't previously realized that Apple's proposed Union Square store would call for the removal of a 40-year-old fountain in the plaza behind the store, reports the San Francisco Chronicle. The mayor has indicated that he plans to visit the plaza again in order to see if the fountain can coexist with Apple's new store. "We weren't necessarily focused on that side," Lee said of the Stockton Street plaza where the fountain is. Lee says he will need to "take a look and visualize" how the fountain would work with Apple's proposed raised, narrow plaza between its store and the Grand Hyatt. Also at issue, the 80-foot blank wall along Stockton Street that makes up the Apple Store's rear facade. The blank wall goes against San Francisco's emphasis on street-level experience, as the critic who first pointed out the plan's impact on the fountain also noted. On Tuesday, Chronicle design critic John King drew attention to the fountain issue and criticized the design of the store. Calling the Foster + Partners-designed space "a box that would look at home in Anymall, U.S.A.," King pointed out that Apple's plans for the plaza would also displace a bronze fountain that has been in the plaza for 40 years. 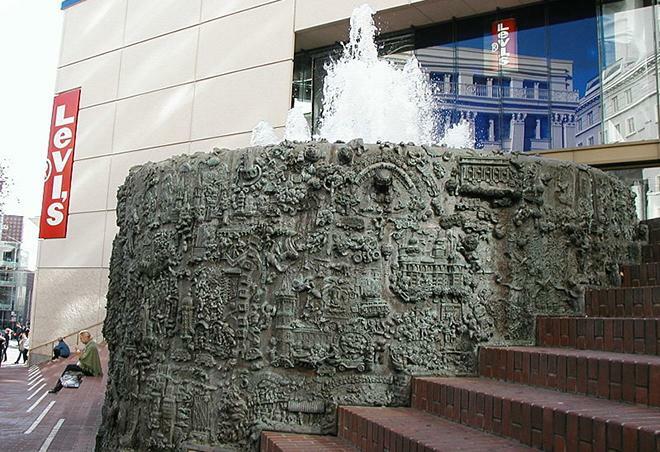 The fountain, designed by Ruth Asawa, displays a map of San Francisco done in stylized relief form. King, contrasting the fountain with the "Anymall" look of the proposed Apple Store, said that the fountain "could exist nowhere else but here." 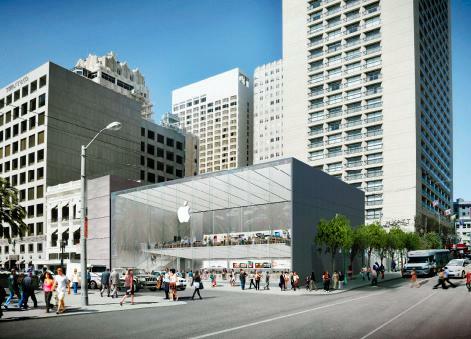 Apple revealed its plans to relocate its flagship store from Stockton and Ellis to Union Square earlier this month. The new location will be 45 percent larger than the current flagship store. Apple has not yet commented on Mayor Lee's remarks. The Grand Hyatt Hotel, which owns the plaza and the fountain, says it's too premature to address any potential changes to Apple's proposal.